Views of the older parts of the new city. In the 19th century Jerusalem began expanding outside the Old City walls. 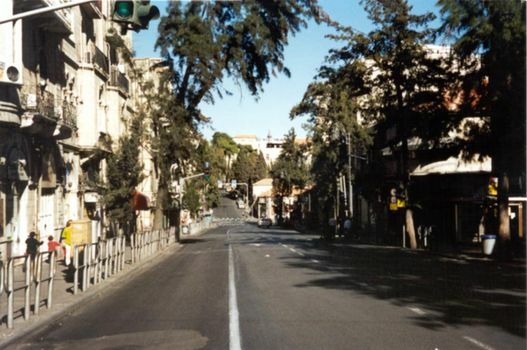 Nearly all the growth lay to the west, particularly along Jaffa Road, which remains a major commercial axis. 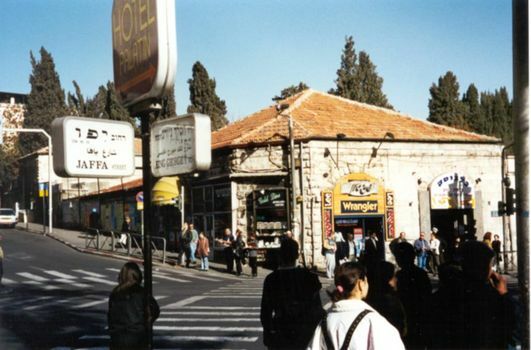 There's a big Orthodox community nearby; other and very different people come for the nightlife, which with many outdoor restaurants is lively, at least by Jerusalem standards. The crowds are so intense that it's easy to overlook the physically rundown character of most of the buildings. 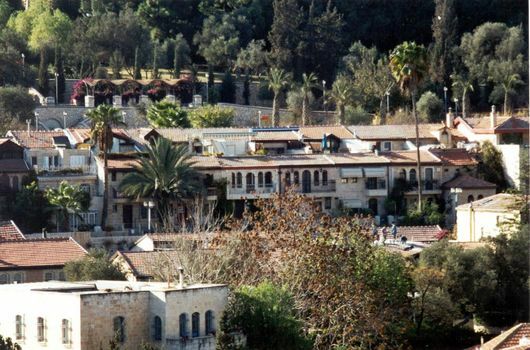 There's been a lot of new construction, but the older buildings have been through a lot, from barbed wire barricades during the British Mandate to bombings in more recent years. Jaffa Road traffic, any day except Saturday. 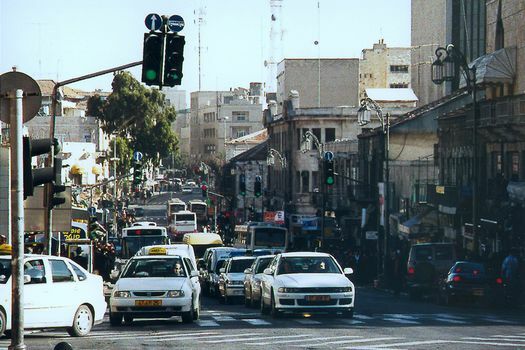 Bits of Jaffa Road retain a 19th century calm. 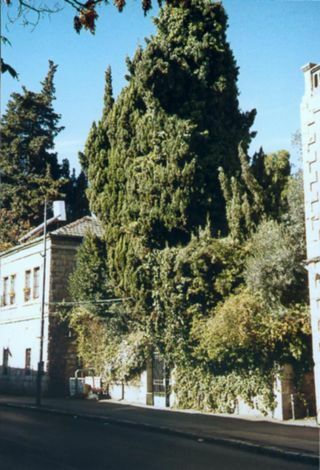 Here, tucked in its own forest is the onetime home of Conrad Schick, the German architect who played a major role in Jerusalem's expansion. 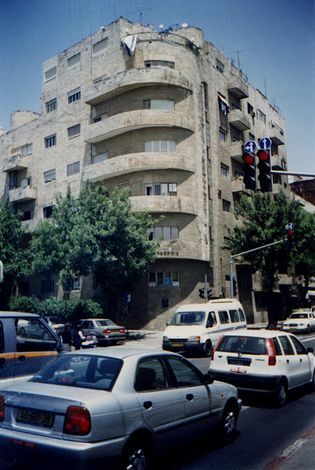 The icons of globalization reach to the intersection of Jaffa Road with King George V Avenue, which was cut by the British during the 1920s as a ring road through the expanding city. 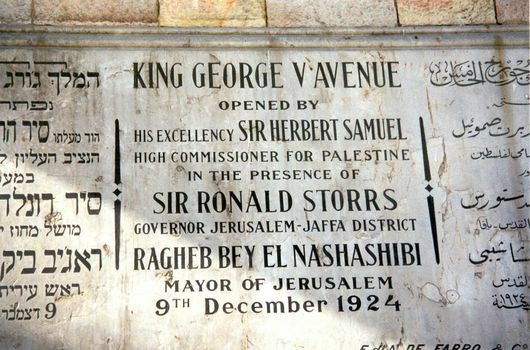 Samuel was the first British governor of Palestine, and the first of many who left the place disillusioned. Storrs, on the other hand, was an Orientalist at a time when that was not a term of abuse. For him, the posting in Jerusalem was a kind of heaven, despite the headaches. The city owes him much, even today. You have to work a bit to get King George V Avenue without traffic, but here it is, lined with buildings from the 20s and 30s. Along King George V, a once-daring Art Deco apartment house. 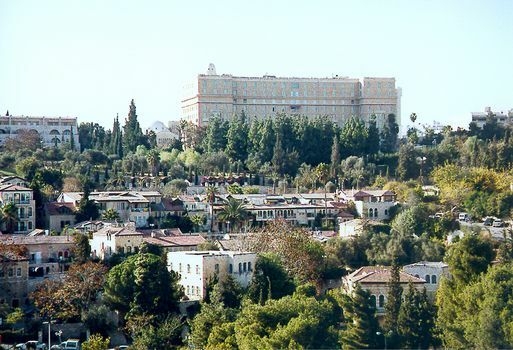 The best-known building along the avenue is the King David Hotel, shown here from the Old City. 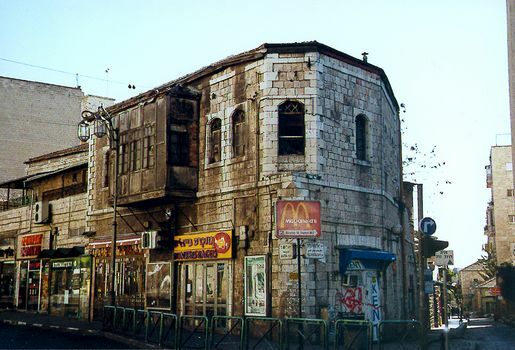 The hotel rises behind Yemin Moshe, a vestige of very early beyond-the-walls Jerusalem. A closeup of Yemin Moshe, which has wonderful views of the Old City--and rents to match. 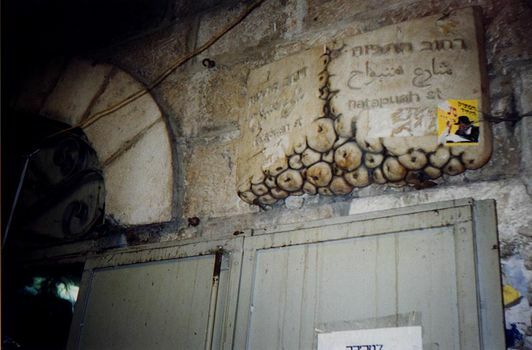 The British-era Mahane Yehuda market contains not only signs suggesting the merchandise on display but Art Nouveau wrought-iron gates, which have been pretty thoroughly barbarized. 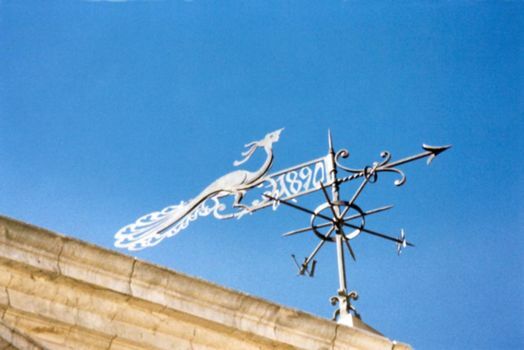 Flanking Jaffa Road, a vane stands atop one of the buildings of the Russian Compound. Built to accommodate the droves of Orthodox pilgrims who came to the Holy Land in czarist times. Its buildings are used now for everything from churches to prisons.